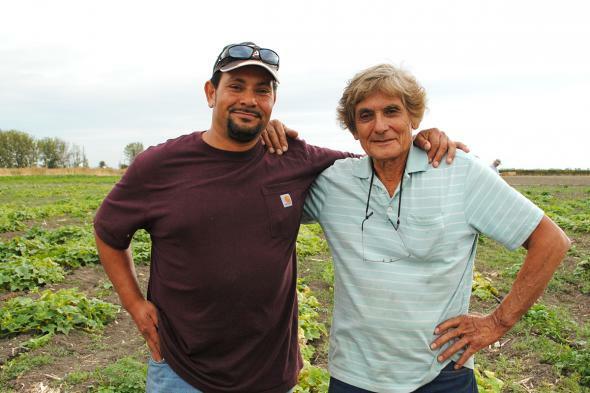 Ben Lucero always farmed organically, but struggled most of his life doing so. 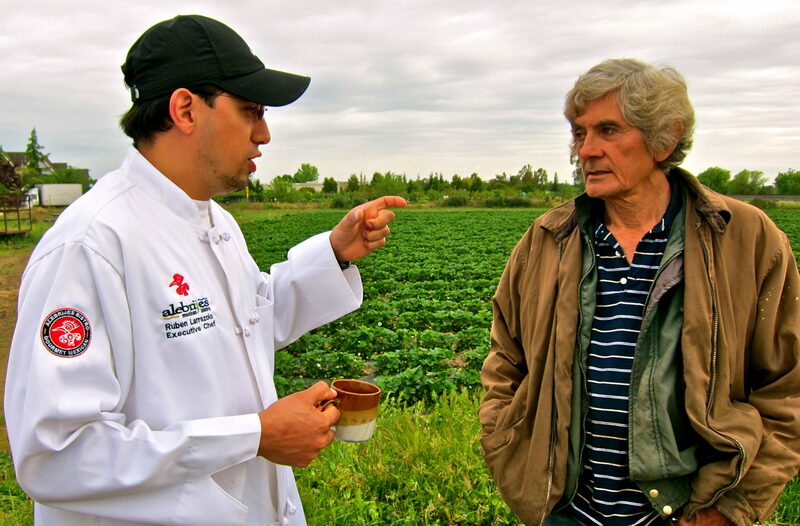 Raised in a farm working family of Native American and Spanish descent, Ben spent his childhood in the fields. As a teenager, he tended a backyard garden with his brother. He started his first organic farm in the 1960’s and although he found it difficult to make a living, he didn’t give up. At times, he did landscaping work just to make ends meet. When the farmers market movement took off 20 years later, Ben found his niche and made a real profit for the first time. Ben farmed in San Martin for many years and was one of the first farmers at CUESA and Menlo Park Farmer’s Markets. After the lease on the farm was not renewed, Ben decided to move the farm to Lodi in the late 1990’s. Land in the central valley was less expensive and he envisioned an opportunity for the farm to be able to prosper financially. Ben leased several land parcels throughout the Lodi area in addition to the 2.5-acre property he purchased. The farm was doing well, but Ben was still having a difficult time juggling working markets, managing his team, and driving equipment back and forth to the land he was leasing. He turned to his eldest son who was retiring from the Army after 20 years of service. Curtis joined the family farm in November 2005. Curtis worked alongside his father as a teenager, but after so many years away, he was a bit rusty to say the least. Over the next several years, Ben taught Curtis everything he knew about farming organically and selling produce at farmer’s markets. With the help of Curtis, the farm was having even greater success, as they were able to grow more produce and expand to more farmer’s markets. After many years of paying multiple leases, electrical bills, and not being in control of the water they used for irrigation, Lucero Organic Farms stepped out on a leap of faith and purchased a 40-acre ranch in Clarksburg. The acquisition was a bit risky as the terms were to pay off the mortgage in 7 years. Farming in Clarksburg had many challenges from working the ground to be able to plant on it, labor issues, and watering, but the Luceros persevered and were able to grow a vast amount of tomatoes, squash, cucumbers, peppers, eggplant, and melons on the fertile soil. The next several years were filled with a lot of hard work and sacrifice and the Luceros accomplished the huge task of paying off the Clarksburg property at the end of 2017. This led to a tremendous opportunity for Curtis Lucero, which leads us to today. We are currently transitioning Lucero Organic Farms partnership from Ben, Curtis, and Karen Lucero, to full ownership to Curtis Lucero. Curtis and his wife, Priscilla purchased a 20-acre ranch in Galt where they will continue the current practices of the farm, but will also expand current operations to include, farm tours, farm to fork dinners, birthday parties, weddings, and a farm stand. The Luceros are looking forward to being more community oriented as they currently primarily serve the Bay Area, which is where the farm originated. 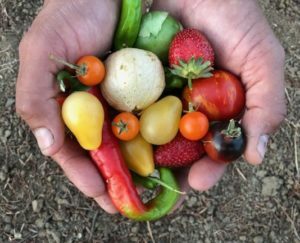 We are a small sustainable, organic farm that provides a variety of the highest quality heirloom fruits and vegetables, fresh from our hands to yours! We grow what we sell. If it’s not fresh, we don’t bring it to the market. We protect the environment by utilizing all organic growing methods and cultivation. We conserve our natural resources by using drip irrigation and replenish our soil with cover crops and crop rotation. What type of soil do you use? Depending on the parcel, the soil types vary from a light sandy loam to a rich, dark, crumbly loam. Each is amended with an organic compost that contains no animal products. Fish emulsion and cover crops enrich the soil with nitrogen, a key plant nutrient. Crop rotation also helps to prevent depletion of minerals in the soil. How do you control weeds in the crops? Lucero Organic Farms manages weed through machine and hand cultivation. Are chemicals used to control pests? Chemicals are not part of our pest control program. We utilized crop rotation, a selection of resistant varieties, hand removal, and create a habitat for beneficial insects. Is organic food beneficial to my health? Studies consistently show organic foods have higher antioxidants than conventional foods. Is more land needed to grow organic foods? Multiple crops are grown in the same space to encourage biodiversity, which improves the harvest. What do you do with produce you don't sell? At the end of each market, some of our produce is donated to the local food banks with a large amount going to the Stockton Food Bank.